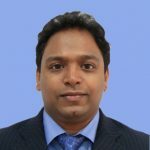 Deepak has 20 years of combined experience in risk analytics and software product development. Prior to co-founding EigenRisk, he led several new product development initiatives in positions including Managing Director of Risk Products at CS STARS (Marsh), Vice President of Platform Solutions at Risk Management Solutions, and Senior Vice President at Aon Benfield Analytics. Deepak holds a Ph. D. and M.S. degree in Civil Engineering from the University of Notre Dame, and a Bachelors in Civil Engineering from IIT Delhi.